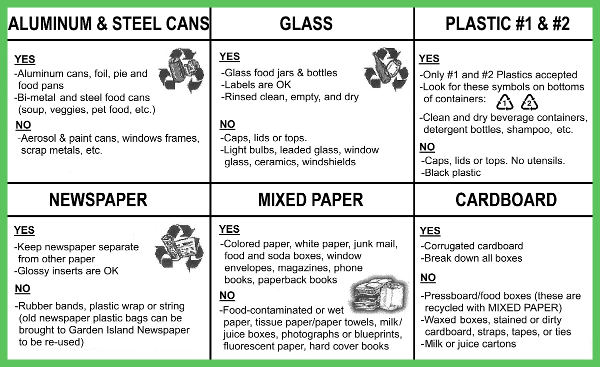 Recycling is one of those things that mainlanders take for granted, people expect their city to collect recyclables and do the right thing. As with so many other things on Kaua’i, it’s not that easy here. Being a small, rural island, the county government has not yet implemented recycling pickup service. At least we do have recycling dumpsters around the islands, but you have to sort all your recyclables. The extra effort deters a lot of people I’m sure, and tons of recyclables get thrown in the trash (probably with some guilt too). Anyway, back to the recycling. I just dump my bag of recylables from the kitchen into the blue bins every few days, then just put the bin at the end of my driveway every 2 weeks. 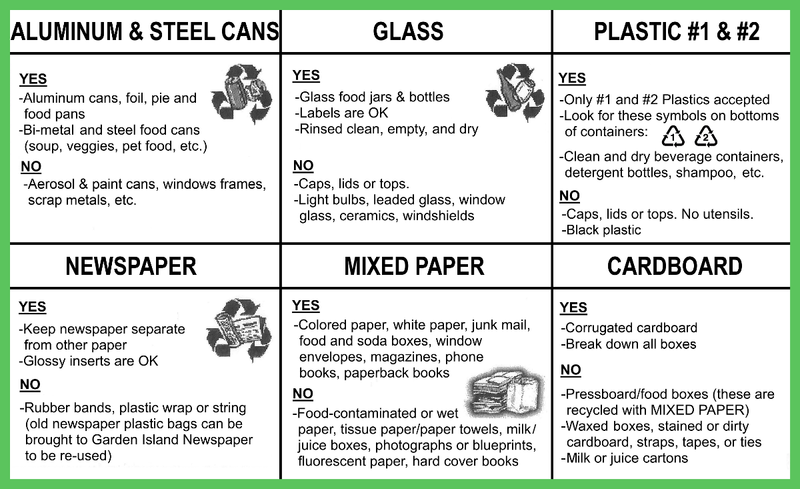 This really saves time and space for me, because I don’t have to sort recyclables and store them in my own separate boxes. I still break down and stack the corrugated cardboard separately. I store the bins and cardboard in a garden shed so they’re out the way and stay dry. 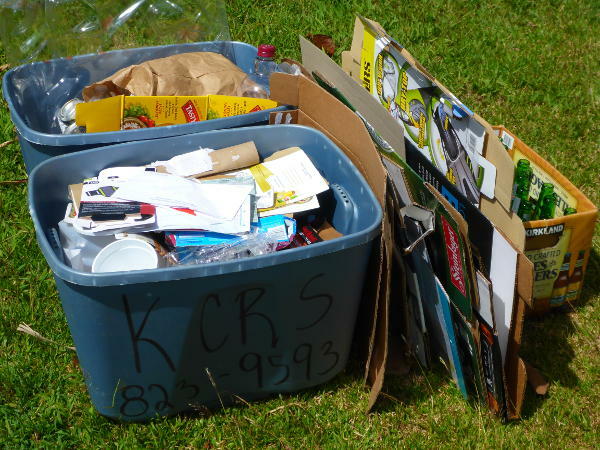 Historical note: there was a similar business back in 2007-2008 called Kauai County Recycling Service (KCRS). I signed up and paid a deposit for the bins, but when they went out of business, they let everybody keep their bins. I’ve been using them around the house ever since. But what about the HI-5 deposit on bottles and cans? Like all recycling services, you just throw them in with your regular recylcing, and they sort them out and get the money for them. It helps them offset the cost and earn a fair living. Because I don’t have to sort, store, and drive to the redemption center anymore, it saves me an hour a month. If you have large quantities, you can negociate with Chris. In the end, I’m very happy that Chris has started this business, and I hope it works out for him. If you’re tired of sorting and hauling your recyclables too, or if you need a custom truck bed, give him a call. 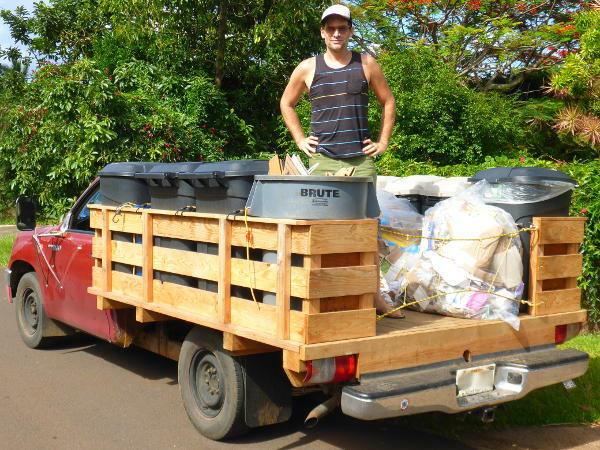 He provides a sorely needed service for Kaua’i residents, it costs only a little and saves me lots of time, and it should increase the amount of recyclables diverted from our landfill. 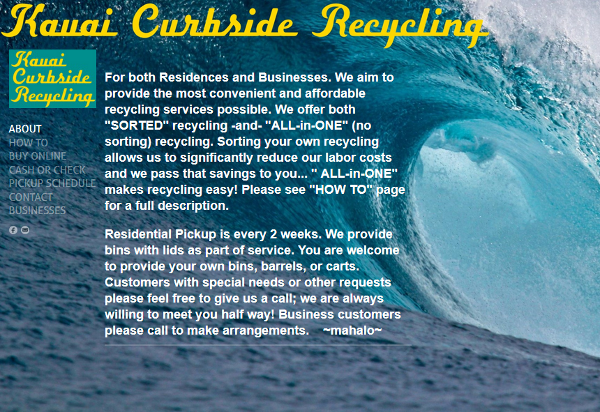 Disclaimer: I am a happy paying customer of Kauai Curbside Recycling, it was my idea to write this post, and I have received no compensation for publishing it. 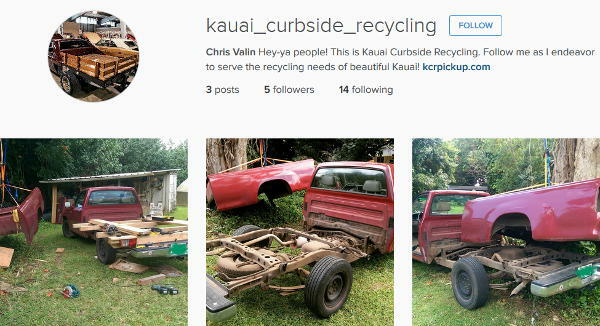 I just want to spread the news about businesses that are good, and good for Kaua’i. This entry was posted on Sunday, July 19th, 2015 at 5:44 pm and is filed under Environment, Reviews . You can follow any responses to this entry through the RSS 2.0 feed. You can skip to the end and leave a response. Pinging is currently not allowed. Do you collect in Koloa? Hi Terry, I don’t think Chris will be checking these comments, so please call his number to check his services. 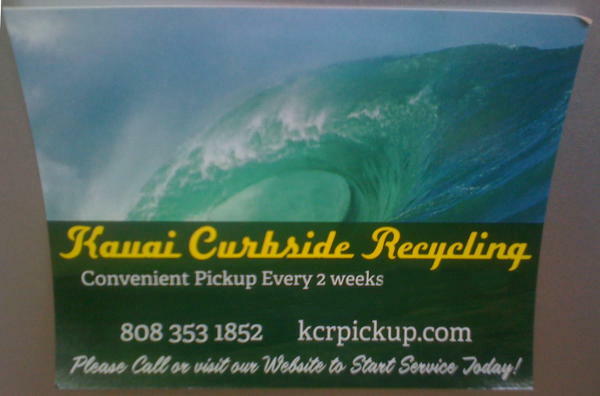 No-news-good-news update: I am still a happy customer of Kauai Curbside Recycling. They have grown with a bigger box truck and an employee, but they still stop by every other week to pick up my unsorted recycling. Prices have gone up a bit, but that’s the price of things here, and I’m still happy with the service. R755 theme designed by varometro. 31 queries in 0.286 seconds.